An argument for simplicity from the best-selling authors of Profit from the Core. Is radical reinvention the key to winning in today’s fast-paced world? Not judging by the results of some of the world’s best-performing companies. In Repeatability, Chris Zook and James Allen - leaders of Bain & Company’s influential Strategy practice - warn that complexity is a silent killer of profitable growth. Successful companies endure by maintaining simplicity at their core. They don’t stray from, or regularly discard, their business model in pursuit of radical renovation. Instead, they build a “repeatable business model” that produces continuous improvement and allows them to rapidly adapt to change without succumbing to complexity. Based on a multiyear study of more than 200 companies, the book stresses the value of repeatability in business, showing how the “big idea” today is really made up of a series of successful smaller ideas driven by a simple and repeatable business model. 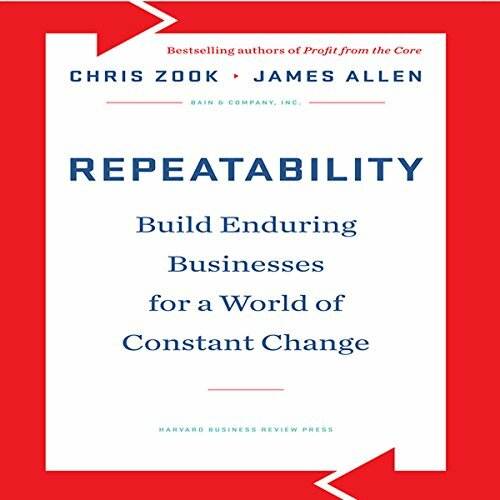 Zook and Allen show how some of the world’s best-known firms combine a core differentiation model with speed, adaptability, and simplicity to land them at the top for long periods of time. These firms include: Apple, Danaher, DaVita, IKEA, Nike, Olam, Tetra Pak, Vanguard, and others. CEOs, senior executives, managers, and investors all need this book. It’s the new blueprint for reaching the top - and staying there. They do a good job of emphasizing what parts of the business should be simplified and made repeatable to scale. This book is NOT about specific standard operating procedures and checklists. More, it is about simplifying the he underlying vision to execute repeatable success. The Best Business Book I've Read...Ever! I know, this is a bold statement, but entirely true. This is THE best business book I've ever read because it takes something that is so instumental to a business' success (strategy) and give some ways to make sure that humans don't overcomplicate it or take their eye off it. I've had experience working with Bain Consulting, and will tell you they have great minds and really validate whatever they put their name on. For instance, the research that they performed and site in this book was proved out via completely different ways (analyzing pure data/attributes of companies *and* via c-suite interviews). They found nearly identical results, so you can feel confident that focusing on your core business, incorporating feedback from frontline employees and customers, and creating a way to translate nebulous strategy into daily activities is the best way to replicate your company's greatest successes over and over. If you are an executive or frontline manager, this is a must read. In fact, you should commit it to memory.